With VMP-254 was decommissioned in 1949 at MCAS El Toro its photo reconnaissance aircraft F7F-2P Tigercats and F4U-5P Corsairs were transferred to HEDRON-1 of 1st MAW then located at El Toro. 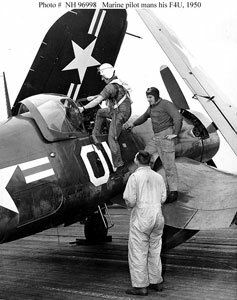 In the Spring of 1950 a five plane Corsair detachment was assigned to CAG-5 for workups and deployed to the Pacific onboard the USS Valley Forge (CV-45). The Marine photo detachment was led by Capt. Jesse “Davy” Booker a “hard as nails” Marine who had flown fighter missions in WW II with VMF-218, then spent a year with VMO-3 in China. The Valley Forge, known as “Happy Valley” by the crew would lead TF-77 as it was the only carrier assigned to Seventh Fleet in the Pacific theater. On 25 June, 1950 the carrier was in port in Hong Kong when the news came that the North Koreans had invaded South Korea. The carrier immediately sailed North but was held off its home base in Okinawa for several days by the JCS where it could move to protect Taiwan if there was a coordinated communist offensive underway. Once there was no concurrent Chinese action it was ordered into the Yellow Sea to attack the North Korean airfields around Pyongyang with maximum effort on 3 July. CAG-5 had 2 Panther jet fighter squadrons, 2 Corsair fighter/attack squadrons and one AD Skyraider attack squadron in addition to the USMC Corsair Photo Det. This first strike by the Navy resulted in two Yak fighters being downed by the Panthers, and the airfields heavily damaged along with a near by rail yard. No strike aircraft were lost. The first combat mission of the war flown by a Marine was to get a BDA of the targets that had been hit. Based on experience in WW II, a Corsair from VF-53 escorted the Marine F4U-5P on its photo mission and was on the look out for NKAF fighters that might come after the lone section of Corsairs. Lt.(jg) Darrow, flying wing on the photo plane believed to be piloted by Capt. Booker, spotted a Yak-9 rolling in from their rear and tried to warn him but to no avail as his radios were apparently out. Darrow broke into the YAK who for some strange reason did not fire and backed off allowing Darrow to join on the photo plane and get the pilots attention. Luckily they were able to complete this first photo mission of the Korean War unharmed and trapped back aboard ship with the film. After a short refueling and rearming pause off line, the Valley Forge returned to action on 18 July and in another large raid destroyed the large oil refinery at Wonson. After five days of armed recce and interdiction missions the first CAS mission in support of Army and ROK troops defending the Pusan Perimeter was conducted on 23 July. It would remain CAG-5’s primary mission for the next two months and included support for the 1st Marine Provisional Brigade once it entered the action. By the end of July, Capt. Booker had flown 25 photo missions and was credited with destroying seven trains with rockets during those missions. On 7 August, Capt. Booker was shot down and became the first Marine captured while taking photos of a bridge for follow-up strikes by CAG-5. He was later introduced by Seoul City Sue on her propaganda radio show but narrowly averted being killed when the North Koreans herded over 100 POWS into a trench and machine gunned them after the Inchon landings. He survived the POW death camps and was released in September, 1953 as one of the longest held POWs. 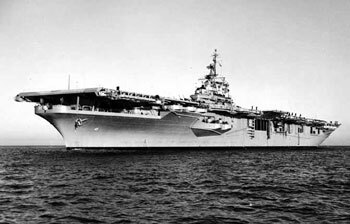 The USS Valley Forge and CAG-5 remained on duty until 19 November, 1950 when it was ordered back to San Diego where it was joined by another CAG and returned to action, this time with a Navy Photo det. (Write-up by Col. H. Wayne Whitten USMC (ret) based on the book “Crimson Sky” The Air Battle for Korea by John R. Bruning Jr , published in 2000 by Potomac Books, Inc).